The Dance team poses with its national championship trophy from the Game Day competition. Each dancers’ hair was carefully braided in a lengthy process before the long flight to Florida. Makeup was deftly applied, loose rhinestones were re-glued, hair pieces were attached, bodies were stretched and after that six-hour process, the lights came on, the music started and the Grand Canyon University Dance team captured the national championship in Game Day performance. The synchronized dance steps and flawless spin moves in time with the seven-member drum line gave the judges and fans in Florida a small taste of the super-charged atmosphere at GCU Arena as the Lopes Dance team showed that no one pumps up a crowd with more energy and precision moves than GCU. The drum line energized the crowd during Dance Game Day at nationals. 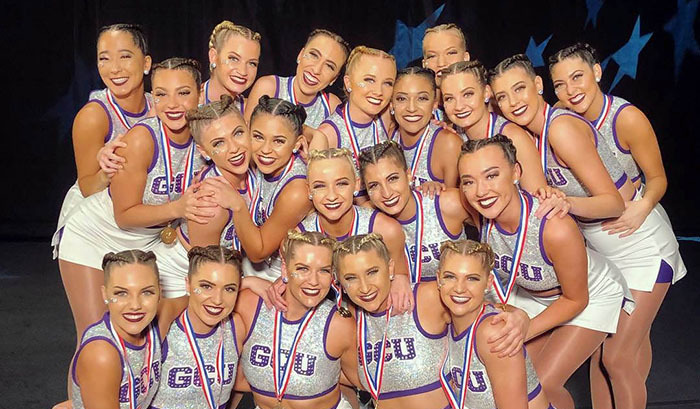 In a sign of GCU’s growing presence on a national stage, the Dance team finished runner-up on Sunday in its other event, Division I Jazz, at the Cheerleading and Dance Team National Championships at Orlando, Fla., conducted by the UCA (Universal Cheer Association) and UDA (Universal Dance Association) at the ESPN Wide World of Sports Complex. That finish, behind Utah Valley, was their second-highest finish ever, behind their title on Friday in Game Day. 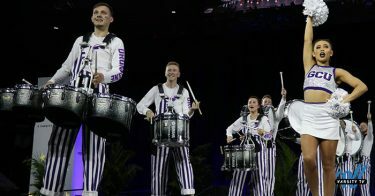 In the first event, the national-championship Game Day effort, GCU was the only program to include a mascot, Thunder, and its seven-person drum line (one snare, two tenor and four bass) guided by Band Director Paul Koch, the husband of Jacque. They played a song called “The Best Groove Ever,’’ and the dancers also moved to the prerecorded school fight song performed by the entire band. The standing ovation from the crowd was gratifying. GCU Dancers perform the winning routine at UDA nationals Game Day division. McKenna Ross, the Dance captain for nationals, said she developed a strong feeling about her team since tryouts last May. Captain McKenna Ross accepts the championship trophy. 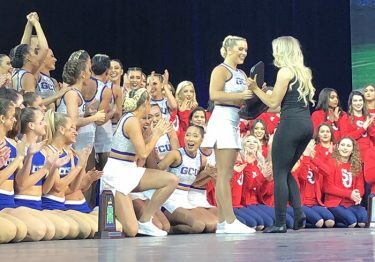 Dance team members who stayed behind to perform at the men’s basketball games last week at GCU Arena met their brethren at Sky Harbor Airport when they returned from Orlando on Monday night. “It so special they were able to come,’’ she said. The Dance team also was supported by parents and siblings who attended the event and those who watched on the internet and ESPN3, along with students who offered congratulations via social media. According to Genung-Koch, the team set three goals for nationals and reached each one. The first goal was to have productive practices – efforts that were measured by self-evaluation. Second, the team strove to finish in the top 25 percent in the Game Day competition. Third, the team was determined to improve on its fourth-place 2018 finish in the Jazz competition — with the runner-up effort — that box was checked, too. As Ross noted, the judges were looking for intricate and synchronized dance steps in the jazz routine. The Dance team poses with the runner-up trophy for Division I jazz. As with all performances, the team relied on their faith. 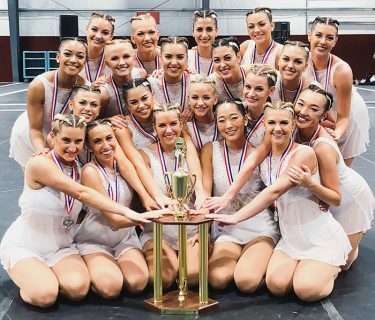 That togetherness showed through, along with hard work, en route to a championship and a runner-up finish in the Dance team’s most successful national tournament ever.